After learning the depressing fact that I read less than 10% from my TBR piles in 2014, I decided to read at least 2 books a month from my TBR pile going forward. 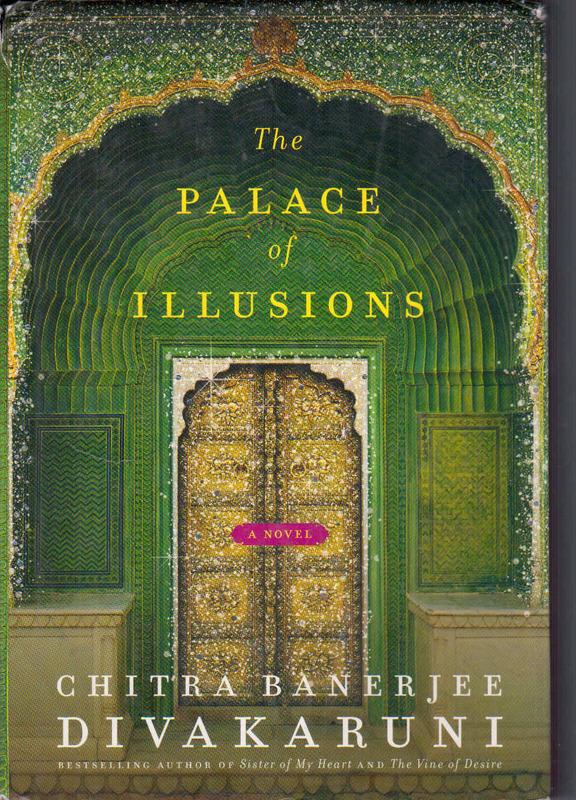 The first book I chose was Chitra Banerjee Divakaruni's The Palace of Illusions. I purchased this book when it came out because, whoa! Feminist retelling of the Mahabharata, that is fantastic! I avoided reading this book for several years because, well, I wasn't sure if a feminist retelling of the Mahabharata was likely to be successful. And I think my qualms were justified. Much as I hate to admit it, it is very, very difficult to write the Mahabharata from a woman's perspective, particularly from the point of view of Draupadi, who had basically zero agency in her whole life. She was born from fire to usher in the Kali Yuga, she was destined from a prior life to have five husbands, and people think she started a war that was probably more likely caused by one of her husbands' gambling addictions. The Mahabharata is one of Hinduism's greatest epics, describing the end of the golden age and the start of the chaotic age (which we are still living in today, if you couldn't tell). It is a truly enthralling and entertaining story, but it's very heavy-handed with predestination and fate and KNOW YOUR ROLE OR THERE WILL BE CONSEQUENCES (this is, after all, the religion of the caste system). Really, when you think about it, no one in the story has much control over the major events of their lives because the gods all decided what would happen eons ago. This is not to say that the Mahabharata is not worth reading. It is. I love it. There is SO MUCH going on there, so many side stories, so many giants of history - it's fascinating. But it's a difficult story to use to shift perspective. Perhaps if you are not familiar with the Mahabharata, this book would work better for you. But as someone with at least a passing knowledge of the story, this novel really didn't work for me. The main reason for this is Draupadi herself. When she came of an age to marry, Draupadi's father held a huge contest for all the warriors in the land to come win her. They had to accomplish a very difficult feat. Arjuna, one of five Pandava brothers, won the contest and therefore won her hand. Through a weird twist in circumstances, Draupadi actually had to marry all five of the Pandavas, but Arjuna was the one who won her originally and the one she had been planning to marry for her whole life. In this retelling, Draupadi apparently spends her entire life in love with Karna, a sworn enemy of the Pandavas (yes, all five of them). She sees a painting of him, someone describes his (admittedly very sad and pitiable) story to her, and then Arjuna just can't hold a candle to him. I get wanting to give Draupadi SOME agency in her life because otherwise, there is not much there. But doing this is like re-writing the story of Cinderella, having her get all dolled up for the ball, and then, in a weird twist of fate, making Prince Charming fall in love with one of the ugly step-sisters before Cinderella even has a chance to win him over. It totally changes the ENTIRE story, and then you have to change EVERY OTHER part of the story somehow to make the circle fit the square. I just could not get over this fact. And the way Draupadi spends literally decades not even seeing or interacting with Karna but apparently thinking about him all the time, even while she has five other husbands right there, is just ridiculous. It's hard to take her seriously. I also think that trying to fit the entire Mahabharata into one fairly slim book is a tall order. Divakaruni brought some stories to life here, especially those related to Bhima and Krishna, but she didn't flesh out most of the other people at all. Arjuna is one of the main characters in the Mahabharata and he barely says ten sentences in this whole book. I can see why this is the case if Divakaruni wants Karna to come out as the hero, but Arjuna is a pretty complex and interesting character in his own right, much like Lancelot, and he's given short shrift here. There are some aspects of this book that I really enjoyed. Karna really was a pretty amazing person with a horrible string of bad luck, and it's nice to see him get some positive attention. Divakaruni makes pretty clear here how unfair people were to him his whole life and how the whole caste system mentality really took a number on him. Krishna is probably one of the most-loved gods in all Hindu mythology, and he was great in this book. All vague pronouncements and comments about letting go and moving on and not getting too attached to worldly goods, shared in a sufficiently god-like fashion. Draupadi's relationship with Krishna starts out as friendship, turns into something similar to a parent-child relationship, and finally ends with a really beautiful section about her personal relationship with God. I have a feeling my reaction to this book is based a lot upon having read and heard so many of these stories growing up, and watching the amazing television spectacle every week with my whole family growing up. It's hard to have one version of the story in your mind and then read this one. I would suspect that if you are not familiar with the Mahabharata, you might enjoy this book more than I did. Thanks. I'd been wondering about this book. What do you recommend as the best translation or adaptation of Mahabharata for someone like me who is struggling to sort out Hindu mythology? It's a big commitment, but I really enjoyed Ramesh Menon's 2-parter. He starts a few generations before the whole massive war, and really shares all of the side stories and gives some of the smaller characters a lot of attention. It takes a while to get through, but it's very readable. I highly recommend it. My review is linked above in the first paragraph - hyperlink is the word Mahabharata. It's interesting that you suggest that one might like this book better without familiarity with the Mahabharata. I started reading The Palace of Illusions knowing even less about the original epic than I do now. I can't quite remember now exactly why I didn't finish it, but I think it was some combination of finding the story confusing and Draupadi annoying. I fully believe that. I wondered if the story made sense to people who were unfamiliar with the epic. And I found Draupadi very annoying, too. I recommend the original! The Mahabharata is so wonderful and amazing. I used to teach Ancient and Medieval Literature, and this was one I really looked forward to. I'm interested in seeing how it could be rewritten in this way, but from reading your review, I think I would have the same problems with it as you did. Ooh, I want to see your teaching materials! I bet they would really spark some thought in me. Draupadi, Arjuna, and Bhima are all characters I chose for my "Fictional 100" list, which includes some legendary figures from traditional epics as well. I felt that Draupadi was a remarkably strong character, given the strictures of her situation, never more so than when she defended her rights at the dice game and demanded a hearing from Bhishma and the other elders. Can this be called "feminist"? Perhaps not. I wish this entire story was better known among Western readers. The shorter retellings available are good for conveying the important events of the story, but the real texture of the original epic demands the longer commitment of a translation like the one put out by UChicago Press or a multivolume English translation from India. As you say, watching the amazing TV serialization over a period of months or years leaves an indelible impression of the story and the characters. I was lucky to see it on the erstwhile International Channel which aired here on cable in the early 1990s. I haven't read The Palace of Illusions by Divakaruni. It's too bad that it didn't seem satisfying. I would like to read new retellings that dig deeper into the characters' emotions without changing them and the story too much, as you describe. Draupadi standing up for herself in that situation certainly shows gumption. I didn't mean that she never exerted herself, just that the Mahabharata is a difficult story to turn feminist because she had no decision power over anything that happened to her. And maybe calling this a feminist retelling isn't fair - Draupadi's feelings are definitely central to the story, so you may enjoy it. I just have trouble reconciling that character with loving Karna from afar for her whole life, so the premise itself was not satisfying to me. The author stayed true to the story, though - she didn't drastically change major events, just Draupadi's feelings. I'll have to look into the U of C translation! Contrary to popular opinion, even among Hindus, traditional students of the Vedas consider the Mahabharatha to be an history of a people, akin to the Torah. To offer a feminist twist to the story would take away the historical implications of it, removing the telling moral lessons which it has to offer. I don't know if that is "contrary to popular opinion." The same could be said of most religious texts, I would think. In my opinion, a feminist bent would not remove the historical implications or the moral lessons but would highlight the consequences of those from a woman's perspective. The issue with the Mahabharata is not only that Draupadi didn't have any agency, but that hardly anyone did. It's hard to tell a story like that and give characters motivations and justifications when the basic premise is that everything was pre-destined. In that way, taking away the religion and telling it as a historical story would probably be a more successful way to make it feminist as one could then stop using fate and prior lives as justification for everything. But again, removing the gods makes it a completely different story, and THAT version would certainly miss out on the moral lessons. I've read several of Divakaruni's book, but not this one. I may give it a try since I don't know much about the story. Have you read anything else by the author? No, I've not read any of her other books. If you like her enough to read so many of her novels, I should give her another go! I am with you - I don't think Hindu epics can be feminized. They are too much of a male battle story with females being treated more like pawns than characters who actually drive stories in certain directions. I love reading the Mahabharat too, but I have to keep my quibbles about gender outside the door when I read it. Kudos to Divakaruni for giving it a try though!